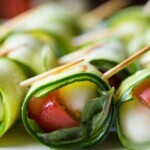 These grilled caprese zucchini roll ups are an easy appetizer, perfect for your next BBQ! All the flavors of caprese salad, wrapped in a zucchini ribbon. Pre-heat grill over medium-high (400°F on my BBQ). Place one basil leaf, cherry tomato half and bocconcini on a zucchini strip. Roll as tightly as you can, and secure with a toothpick. Brush roll-ups with olive oil and sprinkle with salt and pepper. Grill until the zucchini is lightly charred, 1-2 minutes per side.